For a long time it’s been a goal of mine to bring a boat to Cambridge. I researched the rivers and locks years ago, but had given up the idea until I saw how Roger Taylor sailed the oceans on a shallow draft boat. I’ve now achieved my goal with Tammy Norie. 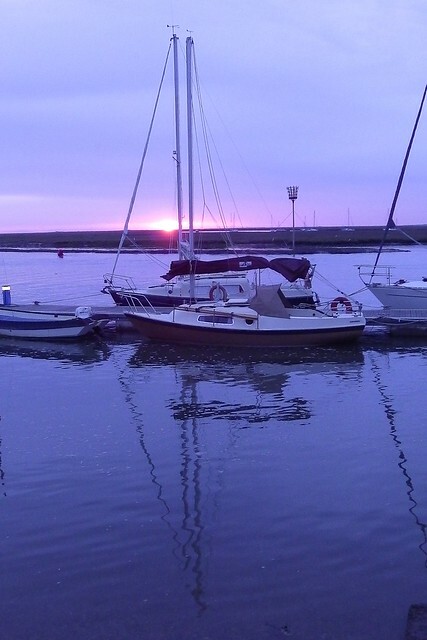 I wrote about the plans two weeks ago, but strong westerly winds prevented me from leaving Wells-next-the-sea. I was finally able to escape on Monday, sailing to King’s Lynn. 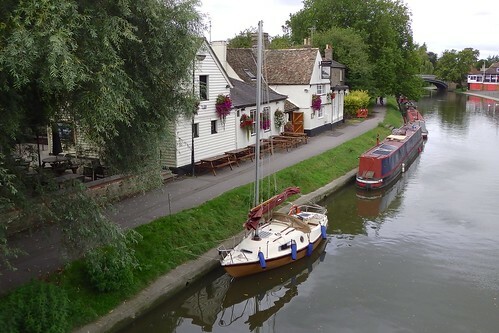 On Tuesday morning I motored up the Great Ouse river and entered the inland waterways at the Denver Lock Complex, reaching Littleport at about 13:00 before taking the train home (and getting some work done). The following afternoon I returned to Littleport with my friend Gareth and we set off at 16:00, passing Ely, visiting an old friend for fish and chips on a narrowboat at the Cambridge County Polo Club, traversing the Bottisham and Baits Bite locks in the dark, and finally pulling up at the Fort Saint George pub, less than 200m from my house, at midnight. On Thursday the Cambridge University Yacht Club held a social meeting at the Fort Saint George, and many friends got to see Tammy for the first time. I also discovered that if six people sit in the cockpit, the drains back up and their feet get wet! I don’t have time to write up many details at the moment, as I’m travelling shortly, but here’s Tammy Norie next to the Fort Saint George. I’ll write up the interesting approach to King’s Lynn on my return. The CG66 registration asks if the boat’s name is on the horseshoe buoy. Mine wasn’t, but presumably they ask this for a good reason. I bought some vinyl letters, cleaned the buoy with Flash and meths, and applied them. Not bad for typesetting in the cockpit at sea! Away from Wells at last with the morning tide, to King’s Lynn with the evening. Winds finally came round. 24 hour forecast: Southerly 3 or 4, backing southeasterly 4 or 5, then easterly or southeasterly 5 or 6. Smooth or slight, becoming slight or moderate. Occasional rain. Good, becoming moderate, occasionally poor. I found the sailing blog of Wild Song via a reply to my YBW thread. It’s a good read in general, but the final post is very useful indeed. Here are a few extracts that I found particularly helpful. 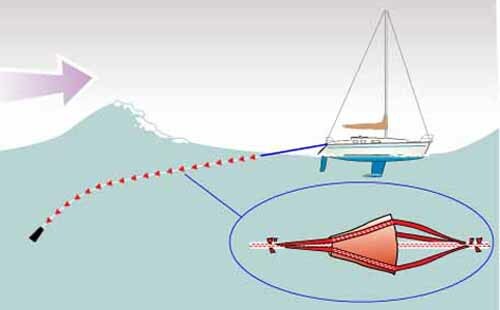 Ocean sailing is much easier than you think. You spend too much time in advance worrying about bad weather when your time would be better spent considering light airs. 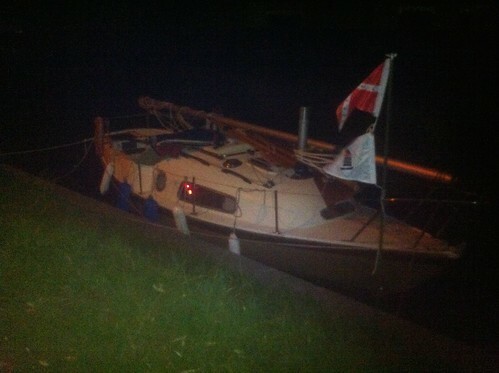 […] Light airs do more damage to boats than heavy weather. Sheets fray and chafe, shackles work lose, knots come undone. Junk rigs don’t suffer quite the same problems as Bermudans, but one serious problem is repeated “slatting” (knocking) of the battens against the mast. 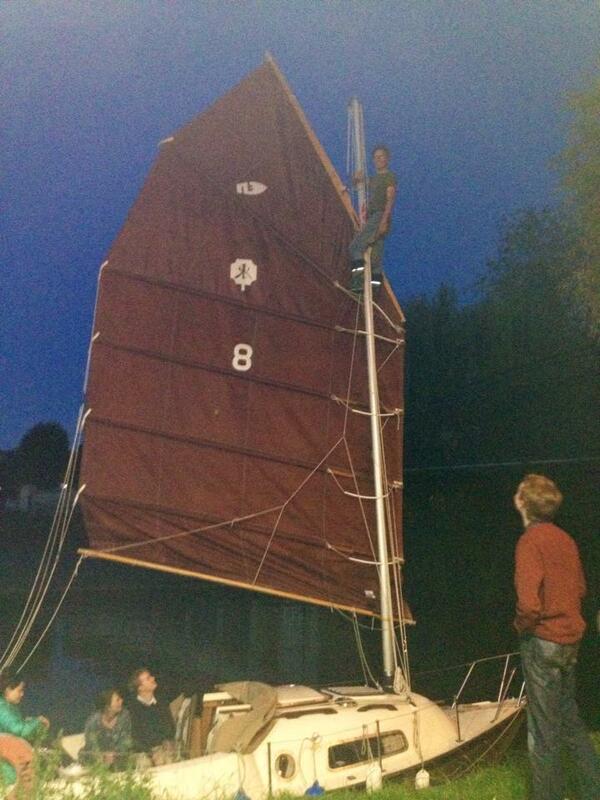 I’ve also noticed the sail swinging, rubbing the battens and making the parrels chafe the mast like saws. Sacrificial painting of the mast might be a good idea, but it might also be worth inserting sacrificial material between the mast, battens, and parrels when the wind is light. I have learned that it doesn’t matter what boat you have. Whatever boat you have you must know it inside out. […] You have to know every nut and bolt of every bit of kit, every rattle in the boat, every sound she makes, and then you instantly know when something is not quite right. It takes time- there’s no other way. But once you have that knowledge you can relax. This is one reason I’m very pleased to have a small and simple boat. I will be able to know every part of it very well and carry spare parts and repair kits for almost everything. I never reckoned on how much time would be spent doing nothing. Plan for boredom. I’m very hard to bore. Wild Song’s skipper lists thing for consumption but I know that I must take things for construction. I think the AIS receiver is possibly the greatest safety device of modern times. I’m trying to avoid electronic gadgets, even though I’m a lifelong computer geek. But I have been thinking about AIS. So far I haven’t found something compact, waterproof, and portable, which is what I’d prefer. I really just want it for the proximity alarm and nothing else. Do astro navigation. It’s rewarding to learn you way round the sky, and it takes up an enormous amount of time. I love the night sky, and from the sea it’s absolutely magnificent. This will be no chore at all. It was very hard getting Tammy Norie off the beach at Sea Palling, and by 06:00 I was already exhausted and would have liked to have taken the rest of the day off to tinker with the boat. But the weather was due to turn from easterly force 5s to westerly force 8s by the evening as ex-hurricane Bertha tracked into the North Sea. I had to get going to Blakeney or Wells. And I was already shattered. So, after breakfast and a breather on the anchor I set off westwards. Was I asleep just then? I’ve always had a problem controlling sleep. I sometimes joke that I can sleep standing up. I have fallen asleep during conversations. I can sleep anywhere, and when I’m tired I don’t have a choice. I simply sleep. Other people say that they’re jealous of my ability to take naps or sleep during the day. On the other hand, people are sometimes a little put out that I allow myself to sleep. The thing is, it’s not voluntary. I don’t really have a choice. When I’m tired, I will sleep. Now, this could be a blessing or a curse for a solo sailor. The ability to take naps and drop in and out of sleep could be very valuable, since a solo sailor has to wake up frequently to keep a look-out, especially for approaching ships. Solo sailors set alarms to wake themselves up every 10-15 minutes at night. During the day, if visibility is good, you can afford to sleep for longer. But what if I can’t stay awake when I need to? What if I’m crossing a shipping lane when tired and nod off? I know from experience that I can’t simply will myself to stay awake. Well, here on this short journey from Sea Palling, was a chance to test myself. I took myself far enough off shore that I wasn’t seeing any lobster pots, set my iPhone alarm for 10 minutes, and sat still. That’s all it took. Suddenly it was four minutes later. I’d been woken by a large wave throwing Tammy a little off course. This pattern repeated itself. I was sleeping quickly, but being woken by changes in rhythm. After a while I started sleeping for eight or nine minutes. Never once was I woken by the alarm, though, and I wonder if I was getting any real sleep at all or just failing to be conscious. But there was something else happening. I was hearing voices. Nothing clear, nothing obvious, but just occasionally I thought I could hear a word or two on the edge of hearing. The first few times I looked around, thinking that another boat had come close, or that someone was shouting on the beach and I’d accidentally wandered towards the shore. But there was nobody there. I wasn’t dreaming — these were waking hallucinations. I was slightly startled. I’d not had this happen before. I was mainly concerned that it might be a sign that worse things could happen. I’m very aware that I can make poor decisions when tired, and here I was alone on the sea where my decisions could be critical to my survival. At this point I decided that I wouldn’t be attempting to enter Blakeney. I heard the entrance could be tricky. I was very prepared to give it a go, but I felt that I couldn’t trust myself. Wells, I read, were helpful about getting you in. I might need help. I kept up my 10 minute nap cycle, and by the time Cromer and then Sheringham slipped past I was feeling stable, at least. I was still hearing he occasional voice, but didn’t feel as if I would pass out. The long run to Blakeney Point went smoothly, with Tammy surfing happily on the waves. As I approached the mark on Blakeney Point I realised that it wasn’t the clear water mark I was looking at, but the isolated danger mark, Hjordis, and that I was losing depth quite rapidly. I’d need to gybe to head off in the right direction. At this point I realised that I had too much sail up. Tammy was leaping across the waves for a reason. 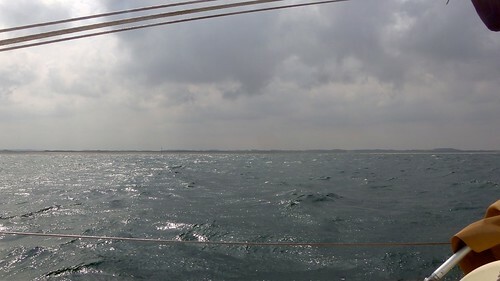 It was a bit of a struggle to get her round and reef, but again the junk rig showed its strength, and I was able to stay in control, change course, and head off the sand with only a few hundred metres of downwind drift. I ran on past Blakeney until I spotted the cardinal buoy at Wells with the binoculars. I tried to radio Wells but they couldn’t hear me well enough, so I called them on the phone. They confirmed what I suspected: I was much too early to get in. Tammy’s rapid progress from Sea Palling had got me there almost three hours earlier than I had planned. It was 12:30 and I wouldn’t be able to cross the bar until 15:00. Wells recommended anchoring at Holkham Bay, about a mile downwind of the entrance. Now, if I’d been more awake I would’ve dismissed that idea, but as it was I thought that if there was enough shelter I’d be able to sleep for an hour on the anchor. So I sailed west and looked for the bay. Well, if there’s a bay there it’s not very clear, and it’s certainly not very sheltered. I sailed quite close to the shore but the wind and waves seemed too high to anchor securely. So I turned around and started beating back up towards the entrance. In fact, it took two long tacks to make it back up, using up all the time available. If I’d anchored and slept I might have missed my chance! Upwind, I was able to deploy a bungee to the tiller and give the autopilot a rest. Tammy Norie doesn’t make great progress to windward, but she’s very stable and reliable on an upwind course. Speed through the water dropped to 2.5 knots, but I was very confident that she’d look after herself and I was able to take several naps while comfortably tucked under the spray hood. Finally, I arrived at the Wells cardinal just after 15:00 and called them on the radio. My friend Nick had come to Wells to meet me and had a chat with the harbour, explaining that I was solo and no doubt that I was likely to be very tired. They kindly sent the beach patrol RIB out to meet me, and they piloted me in through what seemed at the time to be a confusing mess of red and green markers. Somehow, in my exhausted state, I was able to get fenders and mooring lines out while steering with my knees, and helpful hands got me on to the pontoon. I closed up the boat, climbed into Nick’s car, and he took me to a bed. Later, he described talking to me during the journey as an “odd experience”. So, a short test of my ability to cope with lack of sleep. I don’t think it’s good enough. I’m still concerned that I may be in some way unsuited to solo passages. Time to research fatigue management plans. This one’s for boat nuts only, or possibly fellow Coromandel or Corribee owners who might want to know what they’re in for. While weatherbound and on a sandbank at Wells-next-the-sea last weekend I repaired a loose and leaky stanchion. The biggest problem was getting the thing apart, as you will see in this video. I must stress that the arrangement with the backing plate isn’t final. I learned a lot doing this and it’s given me ideas about attaching many of these deck fittings much more solidly. The plate might end up being an L-shaped bracket with tapped holes for the bolts, leaving no protruding bolts. There’s a good title for my non-sailing friends! 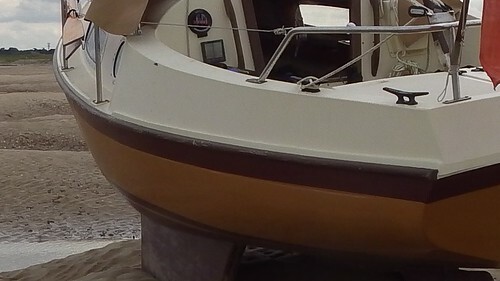 A rubbing strake goes around a boat to protect it from bumping into things. Like a car’s bumper or fender, you’re not really supposed to bump things with it, but it will help if you do, and it can be replaced more easily than repairing the boat. On Tammy Norie, the rubbing strake is two long pieces of a mysterious hardwood called “danta” that are screwed over the deck-to-hull joint — a place where you really don’t want to damage your boat. Here’s a picture showing the port-side rubbing strake. The problem I have is that the starboard-side rubbing strake has rotted where water has run off the decks. This probably happened while Tammy Norie was in storage in a garden for 25 years. 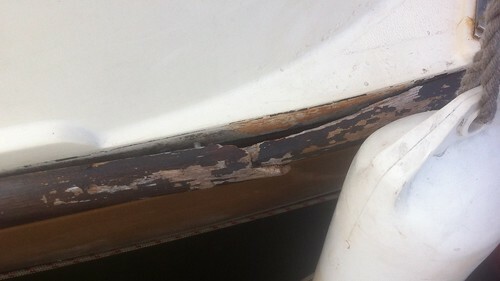 So I need to repair or replace the starboard rubbing strake. A series drogue is a kind of brake that you use to slow down your boat in a storm. In storms your boat can be turned over by big waves. It can be turned sideways to the waves and get rolled over, or it can plummet down the face of a wave, dig in to the next one, and get “pitch-poled”, turning head over heels. These things are pretty unlikely, but I intend to stay alive even if unlikely things happen at sea. The length ensures that the rope gets a steady amount of drag even when the water is being pushed in cycles by the waves. 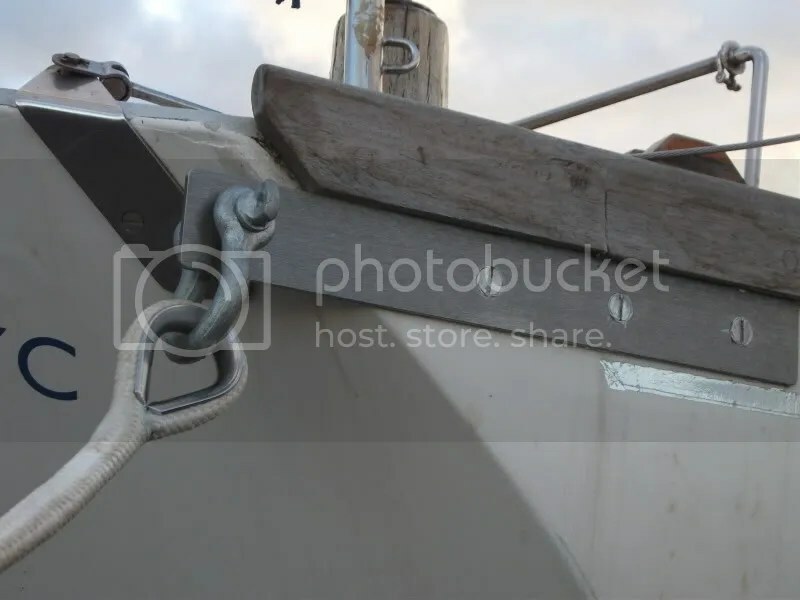 The drogue is attached by a bridle to both of the boat’s quarters (the back corners) so that it keeps the boat facing straight downwind, preventing it being hit side-on by waves and rolled over. US Coast Guard report CG-D-20-87 describes tests and recommendations and is quite an interesting read. Roger Taylor swears by the series drogue on Mingming — a very similar boat to Tammy Norie — and you can see him using his on YouTube. So, what have these two things got to do with each other? Well, you can imagine that there’s quite a serious amount of force on the boat from the series drogue when a wave hits. The coast guard report has a table with suggestions for larger boats. It doesn’t really extend below an 8000lb displacement, and since Tammy Norie weighs about 1 tonne I have to extrapolate a bit, but it looks to me that the table suggests a load of 5000lb or about 23kN. It further recommends that each attachment point be able to take 70% of the design load, which would be 16kN. So I want to be able to hang the entire boat off either attachment. So where and how do I attach the drogue? 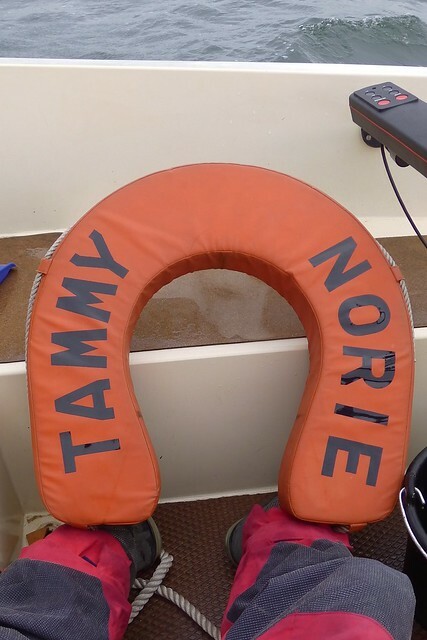 Tammy Norie has a couple of mooring cleats on the quarters. At the moment they’re just bolted to the deck with washers on the back. I already think they need reinforcing, but would I trust them to take repeated 10kN forces over a period of days with my life in the balance? I’m not sure that I trust any fixing at any point on the boat with that responsibility. Another method is to attach chain plates (basically slabs of metal) to the outside of the hull to spread the load, bolted through to backing plates. This makes a sandwich out of a reasonable area of the hull and helps to spread the load. Oceanbrake will even supply some. That would probably be OK, but it would be ugly and involve making holes in the boat. I think I can do better. My first thought was to attach much longer chain plates underneath the rubbing strake. That way they would spread the load further, be attached to the hull-to-deck joint (a strong place), be hidden from view, and can re-use the existing holes that fix the strake itself. But then it occurred to me: why not replace the entire rubbing strake with a stainless-steel strap? In fact, why not replace both strakes with a single strap that goes right around the bows? That would really be spreading the load. The boat would effectively be embraced by a very strong girdle, with very little load on the fibreglass at all. I’m certain you could hang the boat off that. It would have other advantages. The hull-to-deck joint would be reinforced, and other things nearby (such as the stanchions, cleats, and anchor fitting) could be bolted to L-shaped backing plates that were also bolted to the strap. I could be pretty certain that they weren’t going to rip up bits of deck then, and could take heavy loads. It isn’t even that expensive (about £100) or heavy (about 10kg). How would it function as a rubbing strake? I’m sure it would protect my boat, but it might be antisocial, taking chunks out of other boats or docks. However, it would be quite easy to tap holes and screw a sacrificial wooden or rubber strake over the top. I have an alternative plan: a rope strake. These are quite traditional. 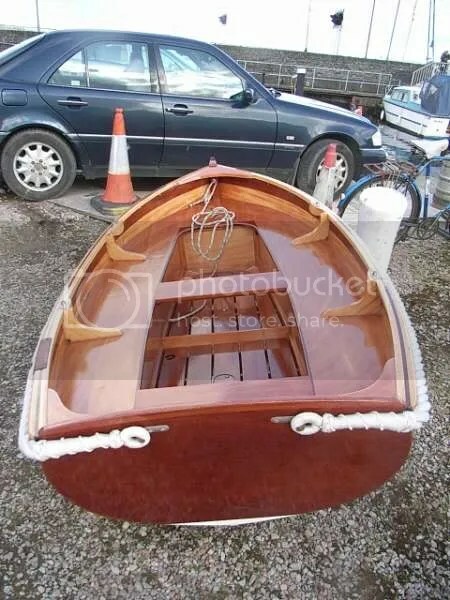 Here’s a lovely example on a dinghy. This is potentially a simpler and easier way of replacing the strake and providing a strong attachment for a series drogue, but wouldn’t do anything to reinforce the hull-to-deck joint or other fixings. I’d very much welcome feedback on these ideas.